This article is about the video game. For the video game series, see Command & Conquer: Red Alert (series). For the iPhone game, see Command & Conquer: Red Alert (2009 video game). Command & Conquer: Red Alert is a real-time strategy video game of the Command & Conquer franchise, produced by Westwood Studios and released by Virgin Interactive Entertainment in 1996. The second game to bear the Command & Conquer title, Red Alert is the prequel to the original Command & Conquer of 1995, and takes place in the alternate early history of Command & Conquer when Allied Forces battle an aggressive Soviet Union for control over the European mainland. It was initially available for PC (MS-DOS and Windows 95 versions included in one package) and was subsequently ported to PlayStation. The PlayStation version was also re-released as a download on the PlayStation Network for PlayStation Portable and PlayStation 3. On August 31, 2008, Electronic Arts, who acquired Westwood Studios in 1998, rendered Command & Conquer: Red Alert freeware. In collaboration with Petroglyph Games, EA announced a remaster of this game along with the original Command & Conquer on November 14, 2018. Red Alert requires each player to use their side's strengths in order to compensate for their weaknesses, in contrast to games such as Total Annihilation or Warcraft II: Tides of Darkness, in which both sides have units with similar abilities and rely on outnumbering or possessing a better balanced force than their opponent. Players acquire credits to purchase structures and equipment by mining for ores and minerals (as Tiberium in the regular C&C series has not yet been discovered in this timeline). Rare gems generate more credits, but unlike ores, do not regenerate within the map. Players can gain more credits and increase their buying power by building more ore refineries and ore trucks. The Soviets' vehicles tend to be more durable and powerful than Allied vehicles, but are often slower moving and more expensive. The Soviets also have superior defensive capabilities against ground attacks, with the Flame Towers and Tesla coil, the latter able to destroy most Allied armor in 1-2 hits although it has high power consumption. The Soviets' weakness is at sea; their only offensive naval unit is the submarine, which exists to counter Allied warships and gain intelligence. It is normally invisible except when surfacing to attack, when it is vulnerable to destroyers and gunboats. The Soviets' secret weapon is the Iron Curtain, a device that renders a selected unit invulnerable to attacks for a short period of time. They also have a wide selection of air units for assault (the MiG-27 (though depicted as a MiG-29 in cut-scenes), Yak-7, and Mi-24 Hind and map revelation through spy planes, and can deploy infantry by air through paratroops or by the CH-47 Chinook transport helicopter (the latter only present in multiplayer). The Soviet "tank rush" was a popular strategy online, involving building many heavy tanks and overwhelming the opponent with sheer numbers. The Allies' forces are generally cheaper, faster to build and more agile. Their infantry can survive longer with good use of their Medic unit. The Allies' strongest tank (the Medium Tank) is weaker in a one-on-one engagement against the Soviets' starting tank (the Heavy Tank), but the Allies also have anti-tank minelayers to counter superior Soviet armor. The Allies have only one air unit, the anti-tank AH-64D Apache Longbow, compared to three Soviet air units; however, the Allies also have anti-aircraft guns (more powerful but shorter-ranged than Soviet Surface to Air Missiles). Allied defenses against ground assaults — pillboxes and turret emplacements — are less powerful than the Soviets' Tesla Coil, but much less dependent on power. On maps with water, Allies possess an advantage in naval power thanks to the Cruiser, which has the longest-ranged and most powerful surface-to-surface attack in the game, as its naval artillery can destroy buildings quickly; and the Destroyer, which is versatile and capable of adeptly taking on any type of unit type in the game—land, sea, or air. The Allies' secret weapon is the Chronosphere, which temporarily relocates a selected unit to another part of the map. They also possess several other tools of subterfuge and military intelligence, such as spies to gain information on or disable enemy facilities, and thieves for stealing enemy resources, hiding their own units and structures from detection, and revealing the whole game map with a GPS satellite. In online play and computer skirmish, both Allied and Soviet forces have access to the nuclear missile silo, which is not available to either side in single-player mode, although it is present in the Allied campaign. In online play and computer skirmishes, the Soviets have access to two of the Allied side's infantry: the Rocket Soldier (for anti-air and anti-tank fighting) and Tanya, a commando capable of easily killing infantry and destroying structures. In addition to the single-player and multiplayer campaigns, Red Alert includes a map editor and the bonus software Westwood Chat. Command & Conquer: Red Alert takes place in a parallel universe. At the Trinity Site in New Mexico in 1946, Albert Einstein prepares to travel backward in spacetime. He activates his experimental time machine to find himself in Landsberg, Germany, on December 20, 1924, where he meets a young Adolf Hitler just after the latter's release from Landsberg Prison. Following a brief conversation between the two, Einstein shakes Hitler's hand, which erases him from the timeline. Hitler's death prevents him from rising to power as leader of Nazi Germany, which creates a new timeline. Without Nazi Germany, the Soviet Union grows powerful under the rule of Joseph Stalin. The USSR seizes land from China and then invades Eastern Europe, to achieve Joseph Stalin's vision of a Soviet Union stretching across the entire Eurasian landmass. In response, the U.S. and the countries of Europe form the Allied Nations start a guerrilla war against the invading Soviet Army. Over the course of the game's story, the Allies and Soviets fight for control over the European mainland in an alternate World War II. Allied ending: Following the siege of Moscow, an Allied platoon discovers Stalin buried alive in the rubble of the Kremlin. Before they begin to remove the debris from the fallen leader, General Stavros stops them. He convinces them that they saw nothing and orders them to leave the premises. Stavros then stuffs a handkerchief down Stalin's mouth before covering his head with a large stone and walking away. Soviet ending: As the Soviets celebrate their victory in the newly captured Buckingham Palace, Stalin commends the Commander (the player), but is poisoned by Nadia, who guns him down as the poison overcomes his body. Following Stalin's death, Nadia tells the Commander that the Soviet Union is now under the rule of the Brotherhood of Nod, who plan to return to the shadows again and reemerge in the 1990s, leaving the player as the puppet ruler of the USSR, ready to do the Brotherhood's bidding for "the foreseeable future." She is betrayed and shot in the back by Kane, who reveals himself to be the true mastermind. During the course of the Soviet's campaign, Kane is seen to make infrequent appearances as a mysterious counselor to Joseph Stalin, and the story implies that he has in fact been the instigator of the world war between the USSR and the Allied nations in order to further the long-term goals of the Brotherhood of Nod. Indeed, Nadia, the head of the NKVD, Stalin's mistress and evidently a secretive member of the Brotherhood herself as early as the 1950s, instructs the player to "keep the peace" until Nod would "tire of the USSR in the early 1990s" upon the campaign's successful conclusion. Kane however shoots her without warning, and proclaims to the player that he "[is] the future". Moreover, during the fifth cutscene of the Allied campaign, a news announcer reporting on the Allies' loss of Greece is suddenly heard stating that the United Nations are in the process of bringing about a unique military task force aimed at preventing future globalized conflicts. This task force is heavily implied to have been "Special Operations Group Echo: Black Ops 9"—the covert and international peace enforcing unit of the United Nations and the precursor of the Global Defense Initiative, one of the two main and iconic factions of the Tiberian series alongside the Brotherhood of Nod. A much debated theory intended to resolve the apparent timeline error which came to exist between Command & Conquer: Tiberian Dawn and Command & Conquer: Red Alert 2 is to consider Red Alert as the genesis of two parallel storylines. If the Soviet campaign were to be completed in Red Alert, the USSR would emerge as the dominant Eurasian power and Kane and the Brotherhood of Nod would subsequently take control of this new empire. Conversely, if the Allied campaign were to be completed, the Allies would emerge victorious and the timeline would instead lead into the events of Red Alert 2 (though Red Alert 2 completely ignores anything that could connect it to the Tiberium timeline). However, Command & Conquer: Tiberian Dawn has the Brotherhood of Nod start out as an underground terrorist organisation, not as a political force in control of the late Soviet empire. This is further confirmed by former C&C designer Adam Isgreen, who confirms that Tiberian Dawn in fact follows on the conclusion of Red Alert's Allies campaign, while Red Alert 2 and Yuri's Revenge take place in a second parallel universe, created by a new attempt to alter history in "Tiberian Incursion", the working title of Westwood Studios' cancelled version of Command & Conquer 3. Isgreen also implied that Nikola Tesla may have been responsible for inadvertently having attracted the attention of the Scrin through his experiments, and thus for the arrival of Tiberium on Earth. When the Command & Conquer: The First Decade compilation pack was released in February 2006, Electronic Arts adopted the policy of considering the C&C franchise to consist of three distinct universes, with this decision apparently violating the storyline connections between Red Alert and Tiberian Dawn established by Westwood Studios. With the release of Command & Conquer 3: Tiberium Wars in March 2007 however, Electronic Arts published a document wherein an implicit reference to Kane's appearance in Red Alert is made—revealing that GDI's "InOps" intelligence division is in the possession of photos of Kane which were taken by CIA that, if genuine, would mean that Kane's age by year 2030 is close to 125. To mark the 13th anniversary of Command and Conquer and the announcement of Red Alert 3, EA released Command and Conquer: Red Alert as freeware. After the promotion ended they allowed third-party mirrors to pick up and also ship the addons for free. The community has started repackaging it to installers that do not require burning the original ISO images and included their latest fan patches that modernize the renderer, remove duplicate files, fix bugs and include content from the PlayStation release. Those repacks typically also include modding tools as well as network utilities for multiplayer matches. In the United States, Command & Conquer: Red Alert debuted at #2 on PC Data's computer game sales chart for November 1996, behind Microsoft Flight Simulator. Following a third-place finish in December, it became the United States' seventh-best-selling computer game of 1996 as a whole. According to PC Data, its domestic sales totaled 347,844 units during the period, which drew revenues of $16.5 million. In 1997, Red Alert held a position in PC Data's top 3 for the first four months of the year, peaking at #2 in April. It was ultimately the fourth-biggest seller of 1997's first half in the United States, after finishing at #4 in May and June. While the game remained in the top 10 through September, it was absent from the top 20 by October. 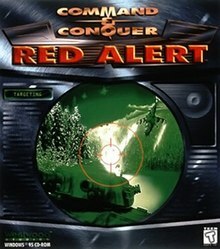 Red Alert ended 1997 as the United States' eighth-best seller among computer titles, with sales of 363,207 units for the year. The game's lifetime sales rose to 869,623 copies in the United States by September 1999. At the time, PC Data declared it the country's 17th-best-selling computer game released since January 1993. In August 1998, Red Alert received a "Platinum" sales award from the Verband der Unterhaltungssoftware Deutschland (VUD), indicating sales of at least 200,000 units across Germany, Austria and Switzerland. The PC version of the game scored 90.91% on GameRankings based on 11 reviews, while the PlayStation version scored 81.40% based on 5 reviews. A reviewer for Next Generation commented that Command & Conquer: Red Alert retains the gameplay elements of the outstanding original game while enhancing the graphics, expanding warfare to both air and sea, and rebalancing the gameplay so that players cannot succeed by simply using the same tactics which worked in the original. He concluded that "in a holiday season swamped with C&C clones, discerning gamers won't go wrong by sticking to the real thing." Vince Broady of GameSpot also commented on the saturation of real-time strategy games in the 1996 holiday shopping season and concluded Red Alert to clearly be the best choice. He praised the unit design and variety, particularly that "the units of the two opposing sides aren't mere copies of each other, but instead maintain a sort of karmic balance." Additionally complimenting the level design, cutscenes, graphics, sound effects, and music, he judged that, "Red Alert belongs in the same category as Civilization II and Quake, games that followed legendary predecessors and immediately eclipsed them." In a review for PC Games which was also published in its sister magazine GamePro, Rob Smith summarized, "The new units, the great story, and the variety of mission styles make up for the limited improvement in the A.I." He also noted that the control interface allows players to quickly and easily select units and order them into combat. Command & Conquer won the 1996 Spotlight Award for "Best Strategy/War Game" from the Game Developers Conference. Computer Gaming World gave it the Strategy Game of the Year award (Readers' Choice). The game was a finalist for Computer Gaming World's 1996 "Strategy Game of the Year" award, which ultimately went to Civilization II. In 1998, PC Gamer declared it the 14th-best computer game ever released, and the editors called it "a perfectly balanced and action-packed epic that functions brilliantly in both the multi-play and the solo campaigns". In 1997, two expansion packs for Red Alert were released for the PC, Command & Conquer: Red Alert: Counterstrike and Command & Conquer: Red Alert: The Aftermath. The expansion packs were designed by Westwood Studios with the "apprenticeship" of Intelligent Games, a London-based game developer. Much of the development on multiplayer maps was undertaken by players from the Compuserve Red Alert ladder. New units, missions, maps and music were included in the expansions. By October 1997, Counterstrike had sold 650,000 copies worldwide after its launch in April of that year. According to Westwood, this made it the all-time fastest-selling expansion pack for a computer game by that point. The Counterstrike add-on included the secret Ant Missions titled "It Came from Red Alert", where the player battles against an army of giant, mutant ants with Allied Forces and Soviet units. The Aftermath add-on contained many new units available in single and multiplayer modes. New Allied units include the Field Mechanic and the Chrono Tank. New Soviet units include the Missile Sub, the Shock Trooper, the M.A.D Tank and the Tesla Tank. In addition, both sides receive the Demolition Truck. The add-on also includes hundreds of new maps as well as a new, significantly larger, map size. On August 28, 1998, Westwood Studios released Command and Conquer: Red Alert: Retaliation for the PlayStation, a compilation of the two PC expansion packs, including the secret Ant Missions. It is almost identical to the PlayStation port of the original Red Alert, except it introduced some new units like Tesla Tank, Shock Trooper, Chrono Tank and Mechanic, and included 105 skirmish maps. Gameplay also included an in-game sidebar code called Soylent Green Mode. In this mode all ore fields turn to people/civilians, and ore trucks harvest them with grisly sound effects. The Retaliation videos are available for the PC Red Alert in the Red Alert modification The Lost Files. This modification adds the Retaliation videos to the Counterstrike and Aftermath missions. It requires Red Alert patch v3.03 or Red Alert patch v3.03 TFD (for the Red Alert version of the C&C The First Decade package). Red Alert Retaliation was released as a download for PSP and PS3 from the PlayStation Network in Europe on March 27, 2008 and in North America on December 3, 2009. OpenRA is a modern video game remake and game engine recreation created by fans. It adds gameplay elements from successors such as fog of war. The focus is primarily on skirmish/multiplayer gaming with partial support for the single-player missions. ^ "Software Retailers on full alert as Westwood Studios' Red Alert Ships (Archive.org)". Westwood Studios. November 22, 1996. Archived from the original on June 5, 1997. Retrieved November 1, 2016. ^ a b Westwood Studios (October 24, 1997). "Westwood Studios Official Command & Conquer: Red Alert FAQ List". Westwood Studios. Retrieved April 23, 2007. ^ a b Westwood Studios (October 23, 1998). "Official Command & Conquer FAQ v3.0". Retrieved May 13, 2007. ^ a b Westwood Studios (October 23, 1998). "Official Command & Conquer Gold FAQ v1.3". Retrieved May 13, 2007. ^ a b "Kane's Dossier". EA Games, Command and Conquer 3 official website. October 29, 2006. Archived from the original on December 18, 2007. Retrieved January 20, 2007. ^ a b c Broady, Vince (November 26, 1996). "Command & Conquer: Red Alert Review". GameSpot. Retrieved January 7, 2018. ^ a b "PC GamePro Review: Command & Conquer: Red Alert". GamePro. No. 101. IDG. February 1997. p. 52. ^ Adam Isgreen (October 17, 2006). "C&C Story". Petroglyph Games. Archived from the original on February 7, 2012. Retrieved August 23, 2007. ^ Adam Isgreen (December 18, 2006). "C&C Timeline (ii)". Petroglyph Games. Archived from the original on September 27, 2007. Retrieved August 23, 2007. ^ Adam Isgreen (December 18, 2006). "C&C Timeline (i)". Petroglyph Games. Retrieved August 23, 2007. ^ Adam Isgreen (December 21, 2006). "C&C Timeline (iii)". Petroglyph Games. Retrieved August 23, 2007. ^ "Kane's Dossier". EA Games, Command and Conquer 3 official website. October 29, 2006. Archived from the original on December 18, 2007. Retrieved January 20, 2007. ^ Red Alert Archive Archived June 13, 2013, at the Wayback Machine, largest Red Alert fan site. ^ Soundtrack Geek. "Press: Selected Quotes from Reviews: Command & Conquer: Red Alert". Frank Klepacki's website. Archived from the original on February 8, 2013. Retrieved February 10, 2013. ^ GamerX (January 10, 1997). "November's 30 best-sellers". CNET Gamecenter. Archived from the original on February 5, 1997. ^ Staff (April 1997). "PC Data Best-Sellers". Computer Gaming World (153): 32. ^ Miller, Greg (March 3, 1997). "Myst Opportunities: Game Makers Narrow Their Focus to Search for the Next Blockbuster". Los Angeles Times. Archived from the original on May 18, 2016. ^ GamerX (March 17, 1997). "January's 30 best-sellers". CNET Gamecenter. Archived from the original on March 31, 1997. ^ GamerX (April 15, 1997). "February's 30 best-sellers". CNET Gamecenter. Archived from the original on July 20, 1997. ^ GamerX (June 4, 1997). "April's 30 best-sellers". CNET Gamecenter. Archived from the original on July 17, 1997. ^ GamerX (July 10, 1997). "May's 30 best-sellers". CNET Gamecenter. Archived from the original on July 20, 1997. ^ GamerX (August 5, 1997). "June's 30 Best-Sellers". CNET Gamecenter. Archived from the original on May 17, 2000. ^ GamerX (August 29, 1997). "July's 30 Best-Sellers". CNET Gamecenter. Archived from the original on February 23, 1999. ^ GamerX (September 24, 1997). "August's 30 Best-Sellers". CNET Gamecenter. Archived from the original on May 6, 1999. ^ GamerX (November 6, 1997). "September's 30 Best-Sellers". CNET Gamecenter. Archived from the original on January 17, 1999. ^ Staff (December 4, 1997). "MS Flight Sim Tops PC Data Charts". Next Generation. Archived from the original on February 4, 1998. ^ Staff (April 1998). "Eyewitness; The Best-Selling Games of 1997". PC Gamer US. 5 (4): 44. ^ "Command & Conquer: Red Alert for PC". GameRankings. CBS Interactive. Retrieved June 10, 2018. ^ "Command & Conquer: Red Alert for PlayStation". GameRankings. CBS Interactive. Retrieved June 10, 2018. ^ "Command & Conquer: Red Alert for PC Reviews". Metacritic. CBS Interactive. Retrieved June 10, 2018. ^ a b "Better Red". Next Generation. No. 25. Imagine Media. January 1997. p. 184. ^ Smith, Rob. "Command & Conquer: Red Alert". PC Games. Archived from the original on May 25, 1997. ^ "Command & Conquer: Red Alert". GameRankings. Retrieved January 7, 2018. ^ Greenlee, Steven Dale (October 1997). "News from the US; Counterstrike Hits Home". PC PowerPlay (17): 14. ^ "Command & Conquer: Red Alert Retaliation". GameSpy. Archived from the original on January 5, 2011. Retrieved August 25, 2010. ^ "The PSN Update!!!". ThreeSpeech. December 4, 2008. Archived from the original on July 10, 2009. Retrieved June 25, 2009. ^ Luke Plunkett (May 9, 2016). "Fans Remake Classic RTS Games Like Command & Conquer, Red Alert". Kotaku. Archived from the original on June 12, 2016. This page was last edited on 30 March 2019, at 04:28 (UTC).